When I first started intuitive eating, I was hyper-vigilant. I was constantly thinking about what my body was telling me and over-analyzed every sensation. Was I hungry or thirsty or both? 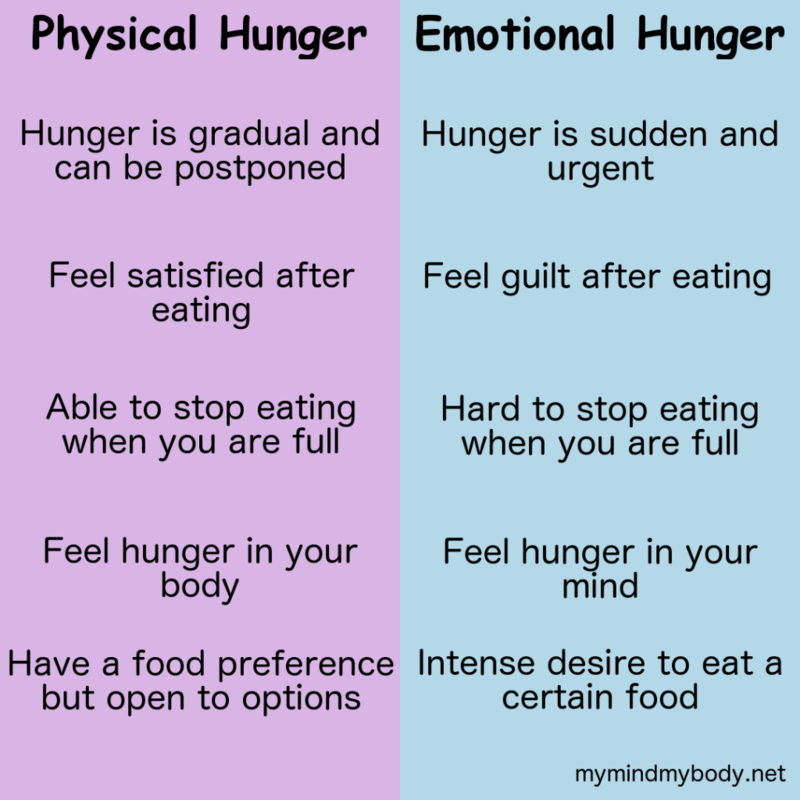 I never considered myself an emotional eater, so it never occurred to me that this may also be part of the equation. Another layer was added to my over-analysis when my therapist gently guided me to the realization that I was eating emotionally. Because I had ignored my body’s natural cues for so long, determining if I needed to drink something, eat something, or tend to my emotional needs was downright confusing. Separating out thirst and hunger cues came fairly easily. Initially, I would mistake thirst for hunger and vice versa. What helped me was to take a moment to drink some water when I started to feel what I thought were hunger cues. If I was still hungry a few minutes after drinking my water, then that meant that I was truly hungry rather than just thirsty. In time, I was able to just know if my body wanted food or drink. At this point, I thought I was done. I had identified when I truly need food and I could move on.1 But something was nagging at me. There were times when I had a desire to eat, but I wasn’t actually hungry. I had already ruled out thirst, so what was going on? I brought this up to my ever-so-patient therapist who pointed that there could be something emotional going on. After vehemently denying that this could be the case, I thought I would hear her out and, over the course of many sessions, I began to realize that she was right. Now this threw a wrench into things! I had believed that I had cracked the hunger code and was well on my way to being an intuitive eater. Now I had to not only differentiate between thirst and hunger, I also had to determine if emotions were a factor. I still refer to this chart if I ever am unsure about what my body is telling me. I take a brief moment out of my day and focus my attention inward. I look for signs of thirst and sensations of hunger, but I also concentrate on what I am feeling.2 When I apply this technique, I am better able to determine my needs, whatever they may be, and address them accordingly. 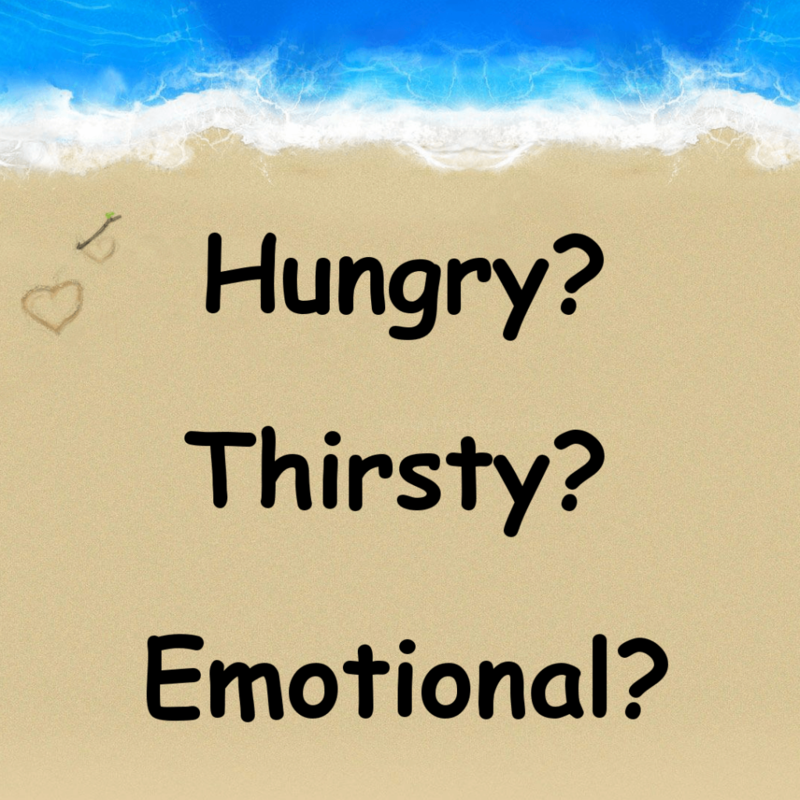 Are you able to differentiate between hunger, thirst, and emotion? Please share in the comment section below.